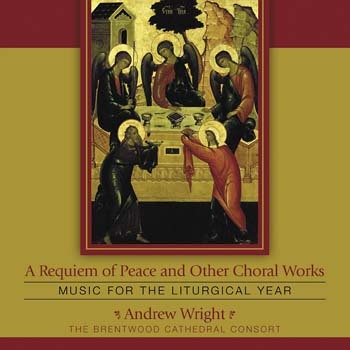 This collection features 11 titles that exemplify Andrew's desire to "create a fusion of the English choral tradition with the pastoral needs of the Roman Catholic liturgy of today." Award-winning English composer and organist Andrew Wright is known for the beauty and liturgical purpose of his compositions. His collection A Requiem of Peace and Other Choral Works features 11 titles that exemplify his desire to "create a fusion of the English choral tradition with the pastoral needs of the Roman Catholic liturgy of today." This compilation features stunning settings of traditional hymns, choral anthems, and a complete Latin Requiem Mass. Each work employs interesting and new forms, lush harmonies and choral textures encouraging active and aural participation. The beautiful seven-movement Requiem of Peace, scored for choir, organ and optional soloists, displays Wright's artistic versatility; taking its form from the earlier works of Gabriel Fauré and Maurice Duruflé it presents a model that is appropriate for use in modern liturgy and as concert repertoire. Recorded in phenomenal acoustics of the historic Cathedral of Saint Mary and Saint Helen in Brentwood, the flawless recording features soprano Julia Wilson-James, the renowned Brentwood Singers and organist Stephen King. It is sure to become a favorite classical choral recording.